Here you will find a short introduction to Costa Rica and practical information about student life in San Isidro. More information in February. 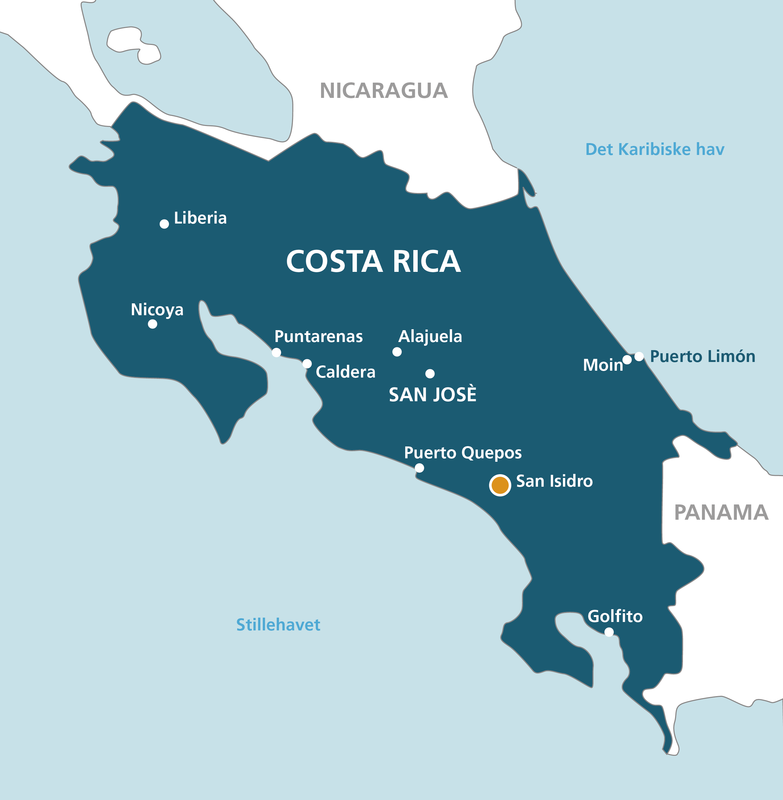 Costa Rica is located in Central America. The country is especially known for its breathtaking nature with dense rainforest covering mountains and volcano ranges that separate the beautiful beaches of the Caribbean from the Pacific coast. Costa Rica is also one of the wealthiest and most stable countries in the region with a very limited crime rate. Our partner university is located in the city of San Isidro in the southern zone of Costa Rica and is approx. 700 meter above sea level. Only 35 km from San Isidro you find the beautiful beaches of the Pacific coast and the country’s bustling capital San Jose is a 130 km bus ride away. Studies take place at the university campus. It is a small and new campus on the hillside overlooking the beautiful green highland valley of San Isidro. The programme fee includes accommodation. The student houses are centrally located. The students share on suite bedrooms, with two or three other students, communal kitchen and living room. By living in San Isidro you have the opportunity of getting to know the locals of the city especially your local fellow students. Additionally, Kulturstudier offers a range of activities, which will give you in-depth knowledge of Costa Rica. Activities include introduction program with welcome party, a guided tour to historical and cultural sights in and outside of San Isidro and lectures on Costa Rican society, history and politics. During the stay we will also arrange different field trips. Kulturstudier has a broad network in San Isidro, which makes it possible for students to engage in different kinds of social activities, such as salsa and surf classes, movie and quiz nights, concerts, football and other physical activities. In San Isidro there are lots of options if you want to experience Costa Rica’s amazing nature, as beaches, rain forests, volcanos, waterfalls and lakes are located relatively close to the city. The climate in Costa Rica is tropical. San Isidro lies 700 meters above the see and enjoys a very pleasant climate. During the spring semester temperatures will rise steadily from comfortable to really hot, with little rain. The autumn semester offers comfortable warmth, but a more humid climate and occasional rain. Sometimes the monsoon coincides with the semester bringing days of hard rain. Click on the link below to see average temperature and yearly rainfall. You arrange your flights yourself. But we recommend that you buy flexible tickets, as plans often change when you make new friends. To ensure that all our students are correctly insured throughout the semester, Kulturstudier arranges a group insurance with Gouda Travel Insurance. This insurance is mandatory for Nordic and German students. Students of other nationalities must buy equivalent insurance in their home country.